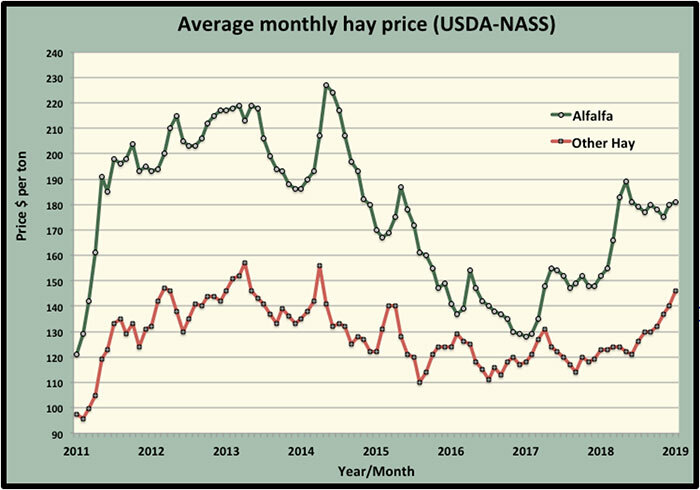 The January average prices for both alfalfa and other hay types continued their upward climb, according to USDA’s latest Agricultural Prices report. The average January alfalfa hay price went up $1 per ton to $181, which followed a $5 per ton price boost in December. The January average alfalfa hay price is $28 per ton more than January 2018 and is the highest January average price since 2014. From December until spring when new crop begins to hit the market, hay values typically rise with a peak occurring in April or May. Keep in mind that the USDA average prices currently account for all qualities of hay sold. That means Premium and higher quality hay is actually at some higher price average. Also, the final U.S. estimate is a volume-weighted average rather than a simple average of state values. Those states with the most volume sales will impact the final U.S. dollar value more than those states with fewer sales. The largest alfalfa hay price gainers in December were New York (up $15 per ton) and Minnesota (up $12). 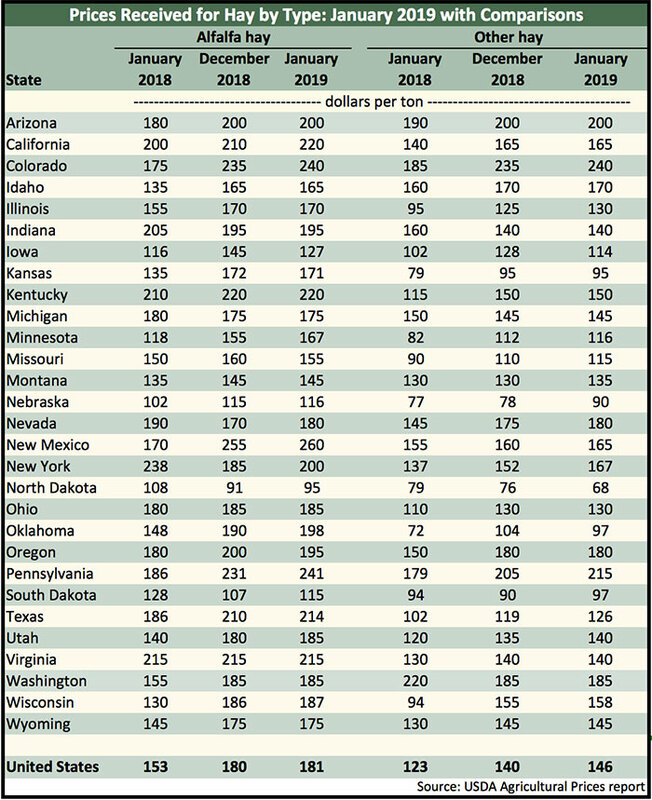 California, Nevada, and Pennsylvania were all up $10 per ton (see table below). Only three states had average alfalfa price declines in January. They were Iowa (minus $18 per ton), Missouri (minus $5), and Oregon (minus $5). The highest average Alfalfa Hay prices were reported from New Mexico ($260 per ton), Pennsylvania ($241), Colorado ($240), California ($220), Kentucky ($220), and Virginia ($215). The lowest prices were found in North Dakota ($95 per ton), South Dakota ($115), and Nebraska ($116). The price of other hay (mostly grass hay) continued to show strength, moving $6 per ton higher in January to $146. This value is $23 higher than the previous year and is the eighth consecutive month without a price decline. The highest price for other hay was reported in Colorado ($240 per ton), Pennsylvania ($215), and Arizona ($200). States with the lowest reported other hay average prices included North Dakota ($68 per ton), Nebraska ($90), South Dakota ($90), and Kansas ($95).